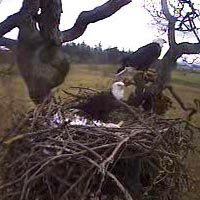 Each year we love to watch the eagle's nests and see if we can observe a successful hatching. Eagles build their nests, called eyries, in tall trees or on high cliffs. Many times they lay two eggs, but the older, larger chick frequently kills its younger sibling once it has hatched. The dominant chick tends to be the female, as they are bigger than the male. The parents take no action to stop the killing. The nest we are keeping an eye on this year has two eggs, but maybe this will be one of the times when both chicks survive together. This video also has great sound of the nature all around. This eagle nest is located in an old Garry oak tree in Sidney, BC - a suburb of Victoria, the capital of British Columbia, situated on the South end of Vancouver Island. The area is near the Swartz Bay ferry terminal on the Saanich Peninsula.